A chance discovery has led to the identification of an unprecedented number and variety of ancient Witch’s Marks in the UK that have been hidden in plain sight for more than a decade. 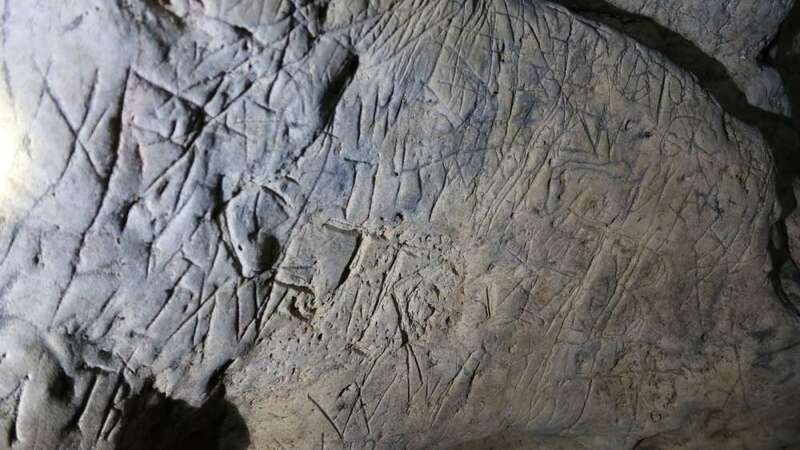 Hundreds of the protective markings were pointed out when a group touring the 60,000-year-old limestone gorge Creswell Crags, located on the border of the Midlands counties Nottinghamshire and Derbyshire, took a deeper look at what experts previously thought were graffiti marks. Upon closer observation, tour guides noticed the extent of the marks carved into the walls and ceilings of the cave as well as over dark holes and large crevices. Similar markings have been observed in historic churches and homes near entrances to “turn away” evil spirits and protect those inside. “These witches’ marks were in plain sight all the time! Being present at the moment their true significance was revealed will stay with me forever. After 17 years at Creswell Crags, it makes me wonder what else it has to surprise us. This remarkable place continues to give up its secrets,” said Heritage Facilitator John Charlesworth in a statement. Most commonly found was a double VV engraving, believed to reference the Virgin Mary, and PM for Pace Maria. Other symbols, such as diagonal lines, boxes, and mazes, are believed to have been added over a period of time in an attempt to capture or trap evil spirits in hopes of avoiding sickness, death, or poor crops. “We’re all still coming to terms with the importance of the find. It’s strange to imagine that 11,000 years after our Ice Age ancestors made their art on our walls, that fear of the unknown may have prompted superstitious locals to return to the rock and make their mark,” said Paul Baker, Director of Creswell Crags. Tentatively scheduled to be deemed a UNESCO World Heritage Site in 2020, Creswell Crags is a 0.5-kilometer-long enclosed limestone gorge at the beginning of a complex cave system that has been used by humans for the last 60,000 years, from the Neanderthals to modern humans, hunter-gatherers and finally modern hunters. The Creswell Crags team says it is now working with experts to more fully understand the significance of the inscriptions.